CONTINUING THE TRADITION: “I love this business. I’m working in the greatest industry, surrounded by beautiful products. Jewelry has a soul. It comes from the earth and is passed down as an heirloom. It has sentiment and significance.” Hank Siegel, president and CEO of Hamilton Jewelers, is proud of the family business his grandfather founded. Hank Siegel is a strong and committed advocate. For his family, his community, and his business. 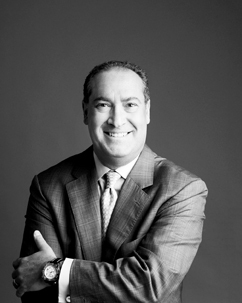 As president and CEO of Hamilton Jewelers, he has led the company to new levels of success, while retaining its core values and its character as a family business. Hank Siegel was surrounded by the family business for as long as he can remember. Hamilton, originally known as George Marks, Inc., opened in Trenton in 1912, and was purchased in 1927 by Hank’s grandfather, Irving Siegel, the son of immigrants from eastern Europe. Hank was born in 1958 in Trenton to Martin (Irving’s son) and Denise Siegel. He was the eldest of the family’s four sons, which also included Jeff, Scott, and Peter. He served as president of his fraternity, which was active in community service, including, among other projects, the brothers volunteering as food and drink vendors at the Atlanta Falcons football games. Although he majored in business, Hank took a wide range of courses, such as philosophy, English literature, and astronomy, all of which broadened his horizons. A major highlight of his college career was meeting Lisette Van Plateringen, who would become his wife. “Lisette was my college sweetheart,” he says with a smile, “and that has never changed!” They were married in 1985. After earning the MBA, Hank moved to Princeton, but before taking on his responsibilities at Hamilton, he had one more educational challenge ahead. His parents wanted him to have a full and comprehensive understanding of what it takes to operate a successful jewelry business. “Now they wanted me to study at the Gemological Institute of America in New York City and get a degree in gemology. This was a 6-month course, and I studied the origin of gemstones, learning to identify, evaluate, and understand their origin. Hamilton has extended its reach over the years, but always retaining a close connection and involvement within its community. A Lawrenceville store was opened in 1973, followed by two in Florida in 1974 and 1988, the Princeton store in 1986, and most recently, a Red Bank location in 2003. Currently, there are four stores, with the Lawrenceville and Trenton stores having closed. Recipient of many awards, ranging from being named Best Retailer of the Year in 1960 to the first family-owned jeweler in the world to be certified by the Responsible Jewellery Council in 2012, Hamilton was most recently recognized as the Best New Jersey Family Business by the Rothman Institute at Fairleigh Dickinson University. Hank Siegel himself was inducted into the National Jeweler’s Retailer Hall of Fame in 1997. Hamilton was elected to membership in the Council for Responsible Jewellery Practices, an international non-profit association representing more than 420 organizations across the gold and diamond supply chain. It is one of only 56 exclusive retail members internationally to be recognized and admitted into this prestigious group. Mr. Siegel’s focus on ethics in business has been evidenced from the beginning of his stewardship at Hamilton. It continued when he became president in 1994, and then later when he joined the Young Presidents Organization (YPO), an association in more than 120 countries emphasizing “Better Leaders Through Education and Idea Exchange”. Mr. Siegel’s commitment to ethics in business and his leadership abilities are very clear to those who work with him, both employees at Hamilton and colleagues in other companies. “I believe Hank has provided exceptional leadership and wise and compassionate counsel to his employees,” says Eric H. Waser, New York Metro Division Head of Citibank, and a long-time friend of Mr. Siegel. “He leads by example, is very thoughtful, and committed to the professional development of his employees. This commitment also extends to the numerous trade and civic organizations he invests considerable time into. Adds Bernie Tenenbaum, Princeton resident, business consultant, and former professor at The Wharton School, University of Pennsylvania: “Hank is a leader. He inspires by the way he deals with everyone he meets. He leads by example and encouragement. He motivates his team members to extraordinary performance. I think Hank wants everyone to win. One of Hamilton’s employees of long-standing is gift department sales associate, buyer liaison, and store display overseer Joanna Riley. “I have been with Hamilton for 22 years, and I have known Hank all that time. He is truly remarkable. He brings a sense of pride and personal commitment to excellence to all aspects of the business. He has an open door policy, which is shown in his willingness to listen, care, and acknowledge all team members. The Siegels and the team here are truly my extended family. It has been an amazing experience to work here. Indeed, Hamilton and Mr. Siegel are very much involved in supporting community charities and organizations. Giving back is important. Last year, in commemoration of Hamilton’s 100th anniversary, they initiated “100 Days of Giving”. The program encouraged all Hamilton associates to volunteer their time to an organization of their choice in their community. They volunteered one day of service to the charity and received a full day’s compensation from Hamilton. Living and working in Princeton for more than 30 years has given Mr. Siegel a special view of this community and its unique qualities. As he says, “I have loved the diversity of Princeton. There are so many people from all over. I love the fact that my wife and I can walk our dogs in town and see people we know and others from all over and all backgrounds. For me personally, community is very important. I am a fourth generation Mercer County resident. I appreciate this area and the community. “Princeton continues to be diverse, a unique combination of people from all levels of society and backgrounds. I enjoy being a season ticket holder at McCarter, and we go to concerts at Richardson Hall and to games at Princeton University. My wife also audits courses at the University. Mr. Siegel is a music-lover — everything from 1960s rock to “The Boss” Bruce Springsteen to opera, especially Puccini’s Tosca. While Mr. Siegel enjoys spending time at home, he often finds himself on the road — or more literally — in the air. “I travel extensively, over 100,000 miles a year, to India, Africa, Asia, and Europe on business,” he reports. “It is my great privilege to serve on the board of the Gemological Institute of America. The Board of Governors is comprised of 16 individuals from around the world with expertise in a variety of areas, such as mineralogy, education, research, and finance, as well as experts from the jewelry and gem industries. “We always have to consider how we can continue to be successful, especially in a rapidly-changing world,” he points out. “This business is in my blood. I learned it from the bottom up, and I especially enjoy the interaction with the clients and my incredible staff. Such reflections bring him back to his family, the business, and what it means to continue such a legacy. He is reminded of memories he and his father have of Irving Siegel’s willingness to accept a down payment, “whatever the client was able to afford, and he would agree to subsequent payments with just a handshake, whether the transaction was for hundreds — or thousands — of dollars. “Clarity as to values is important,” emphasizes Mr. Siegel. “I helped to codify Hamilton’s core ethics when I first joined the company. Clarity about what is important is crucial. We always emphasize community, entrepreneurship and hospitality. “To this day, very much of what I’m about is my relationship with my family. Having my father at Hamilton as chairman is the best. I am able to have the resource of both my father’s and mother’s wisdom. My parents always emphasized family, and this is important to me, my wife, and my two sons, Andrew and Benjamin, whom I respect, admire, and love greatly. They make me proud. And as far as Hamilton is concerned and its continuing legacy, he couldn’t agree more with his father’s point of view and how it reflects his own thinking and career.